You know, there are lots of blogger templates using Timestamp format for posted day instead of DateTime format. We must change the TimeStamp as their format otherwise the date won’t show up properly on each of your posts! Actually the date will most likely be blank and you’ll think the template is broken. 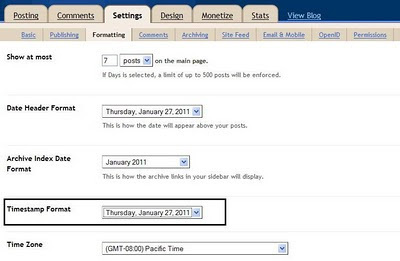 At Formatting tab, change Timestamp Format to format like “Thursday, January 27,2011″.